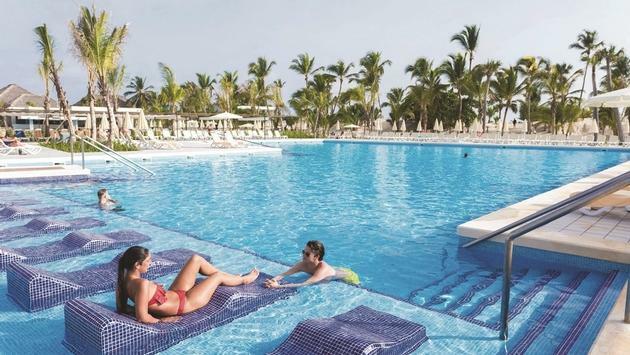 When the all-inclusive, adults-only Riu Republica opened in 2016 in Punta Cana, Funjet Vacations predicted the resort’s 1,000 rooms would be more than enough to serve the needs of the growing audience of travelers seeking fun and sun in the Dominican Republic. Now, with a recently added 501-room wing, the resort just keeps getting better says Funjet. Before its expansion, Riu Republica was already an ideal place to let loose on a Caribbean getaway. Whether you preferred lounging on the white sands of Arena Gorda beach or mixing it up at a weekly beach party, the resort offered plenty of ways to pursue your vacation goals. By the way, if you missed the beach party, there was still the weekly foam pool party to conquer. Yep, things got wild. In the case of Riu Reupblica, better things come in bigger packages. Because the resort’s new wing features a whole new set of travel options. Foodies will want to check out the new options, including Saona, Ole Spanish restaurant, Kulinarium restaurant and even a Jamaican-style jerk grill on the beach. If the aforementioned getting wild is your speed, the new wing features plenty of places to chill with a tasty cocktail. Try Macao bar, Coco’s beach bar and several poolside bars to keep your frosty, fruity cocktails coming. And shh, don’t tell the kids, but the new wing will have its own adults-only water park. While the new wing has a lot going for it don’t feel bad if you’re booked into the original. Every single one of the original 1,000 rooms are getting their own facelift as well, so there will be plenty to see and do for everyone. By the way, pool parties and 24-hour snack service aside, if you’re all about doing nothing at all, then it’s mission accomplished at Riu Republica, where you can always chill on the white-sand beach, dip your toes into crystal-clear, gem-blue seas and just let yourself unwind. For a limited time, Funjet Vacations is also offering up to $2,100 in resort credits at Riu Republica for travel booked and completed by December 31, 2018.